News has recently come in that legendary crime writer Sara Paretsky (pictured right), creator of the acclaimed and influential VI Warshawski series set in Chicago, will be presented with the Mystery Writers of America Grand Master Award at the Edgar Awards ceremony next year. According to the MWA press release, "MWA's Grand Master Award represents the pinnacle of achievement in mystery writing and was established to acknowledge important contributions to this genre, as well as a body of work that is both significant and of consistent high quality." So it's the United States equivalent of the British CWA's Diamond Dagger - the two awards could collectively could be termed 'lifetime achievement' awards, or perhaps represent an unofficial 'Hall of Fame' of crime and mystery writing. Paretsky has also won the Diamond Dagger (2002) - interesting that although she is an American author, she was recognised by the British association first, in this way. Paretsky will be presented with her award at The Edgar Awards Banquet, which will be held at the Grand Hyatt Hotel in New York City on Thursday, April 28, 2011. She will join an illustrious list of legends of the genre, including the likes of Agatha Christie (the inaugural recipient in 1955), Georges Simenon (1966), Alfred Hitchcock (1973), our very own Dame Ngaio Marsh (1978), Elmore Leonard (1992), PD James (1999), and James Lee Burke (2009). "Paretsky revolutionized the mystery world in 1982 with her novel Indemnity. The book introduced detective V.I. Warshawski, a female private investigator who used her wits and fists, challenging a genre in which women typically played minor or passive roles. Paretsky, who lives in Chicago, has written twelve best-selling Warshawski novels. She has also penned a memoir, two stand-alone novels, a collection of short stories, and has edited four anthologies. 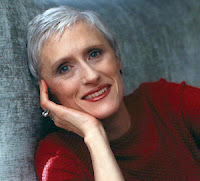 In 1986 Paretsky founded Sisters in Crime, an organization that supports women crime writers, earning her MS Magazine's 1987 Woman of the Year Award. The British Crime Writers awarded Paretsky both the Cartier Diamond Dagger for lifetime achievement and the Gold Dagger for best novel of 2004. Her books are currently published in thirty countries. "The mystery genre took a seven-league stride thanks to Sara Paretsky, whose gutsy and dauntless protagonist showed that women can be tough guys, too," said Larry Light, Executive Vice President of Mystery Writers of America. "Before, in Sara's words, women in mysteries were either vamps or victims. Her heroine, private eye V.I. Warshawski, is whip-smart and two-fisted, capable of slugging back whiskey and wrecking cars, and afire to redress social injustice." Congratulations to Sara Paretsky. I don't think any crime fiction reader could quibble with her being honoured in this way. She fully deserves her place amongst the greats. Have you read Sara Paretsky's VI Warshawki novels? Which was your favourite? What do you think of her MWA Grand Master Award? What other authors do you think should join her on the list in future years? Thoughts and comments welcome. I have been reading Paretksy's novels since the beginning and really enjoy most of them, though a couple of times I thought she stepped over the boundary beteween telling a story and putting forward a political manifesto. I know several readers who agree with me on this but none are American and I do wonder if there are cultural differences that make the overt politics of some of her novels appeal less to non-Americans. This fact aside though her books are rich, Warshawski is a terrific character (who I adored reading about when I was in my late teens given that the only other females in crime fiction were the gorgeous blondes who slept with the male detectives or Miss Marple) and the award is well deserved. I've only read "Deadlock" and I thought it was great. VI Warshawski is a great detective, and the noir writing style and the setting of Chicago were really memorable.